While this blog is primarily about documenting research & construction efforts for my model version of the Valley Line, so much of the richness of the line is really about the folks that worked on the line. It's nice to have a model that's prototypically accurate, but it's even more rewarding to be able to preserve the memory of the guys that made it all happen. Case in point - yesterday's Wordless Wednesday. This photo - like so many photos I use on this blog - was sent to me by John Wallace, who had the foresight to bring his camera along just about every time he rode the line with the local crews. 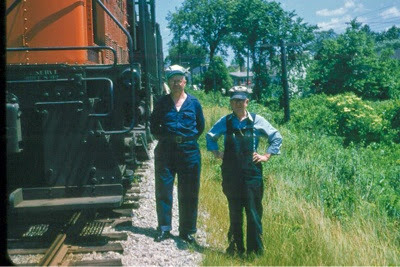 It shows Burt James (fireman) and John Rooney (engineer) next to what was likely a DEY-3 class diesel (Alco S-1), in the Summer of 1949. Based on previous research, the engine was likely #0947. The precise location is in front of the Cromwell station, looking north. You can just make out the crossbucks for the Main Street crossing in the background. If you happen to have the Valley Line articles John wrote for the NHRHTA's Shoreliner magazine, you can read a funny story about Burt's first paid run. And John (Wallace) rode with John (Rooney) on a record-breaking speed run between Old Saybrook and Hartford one night during the summer(?) of 1947. History may have forgotten John and Burt - just two guys who made their living as so many did at the time - and they may have been forgotten by everyone but their families. But thanks to this photo, and the fact it can be so widely shared, John & Burt's memory will hopefully live on a while longer.